I wanted to take part in Rachel’s Olympic celebration because I hate sport and I’m rubbish at it. 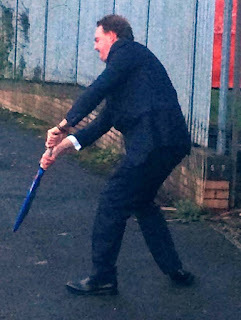 I haven’t lifted a ball, a racquet or a bat for many years – come to think of it I haven’t lifted my bottom off the sofa for a while either. But I digress, I wanted to feel part of Rachel’s sporty celebration because I’ve never felt part of anything sporty – I was always the last one to be picked for netball at school. And when a team was ‘forced’ to have me as a member they always found me a position that involved being about 3 miles away from the action – they called it ‘fielding,’ but they didn’t fool me. So as I couldn’t offer any of my own sporting life to this Olympic Special, I would like to offer my husband’s various sized balls. We married 21 years ago and in a cruel twist of fate he’s as obsessed by sport as I’m repelled by it. He was sports captain at school, still plays cricket and football and when he’s not on a pitch he’s watching various balls flying through nets on the TV screen at home. It doesn’t matter what time it is, what season or what country it might be, but my husband can always find balls to watch on a screen. Often he listens to the radio, watches TV and follows Twitter all at the same time when his ‘ball schedule’ is packed. He calls this ‘a multi-media sporting activity,’ but I call it BORING on every platform! And my husband’s balls aren’t just limited to a screen, even our ‘romantic’ weekends away are dictated by the football fixtures (a last tango in Swindon anyone?) He found a football match on a beach in Greece, a cricket match in a car park at a recent wedding and all our holidays in the US are an odyssey of baseball stadiums with some bits of holiday squeezed in between. So to celebrate this year’s Olympics, and in the spirit of good sportsmanship I give you husband’s balls! So after much soul searching (and comfort eating) Sue abandoned her TV career, bought a pink laptop and wrote 'Fat Girls and Fairy Cakes.' It was then Sue realised she couldn't stop writing and produced 'Younger, Thinner, Blonder' 'Love, Lies and Lemon Cake' and 'Snow Angels, Secrets and Christmas Cake,' 'Summer Flings and Dancing Dreams,' and 'Bella's Christmas Bake Off.' Her next book 'We'll Always have Paris,' came out in ebook in June 2016 and will be out in paperback in 2017. Originally from Manchester, Sue now lives with her husband and teenage daughter in Worcestershire where she bakes (and eats) lots of cake. She spends much of her time making big decisions about whether to have Caramel Chew Chew or Peanut Butter ice cream (or both?) while watching 'The Biggest Loser USA,' and procrastinating over her latest novel.